Pleased to be an official fiber provider for The Livestock Conservancy's "Shave 'Em To Save 'Em" program! 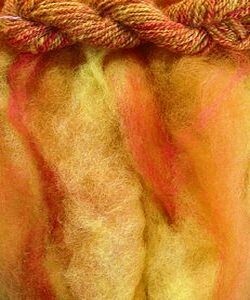 All our natural and dyed wool roving is from our sheep flock and is offered directly to you for all your spinning pleasures. Other fibers included in blends are carefully selected for color and texture compatibility with our wool. Spinning oil (a vegetable product) is added by the processor when roving is created to control the static electricity in the fiber as it flies through the machinery. If your roving should feel tacky or sticky, it is only a result of this added oil. It can easily be washed out by soaking in hot water and detergent either before spinning, or after the fiber is spun into yarn. All dyeing is done here at the farm by hand. 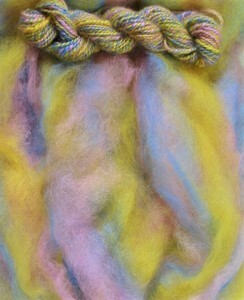 No two dye lots of roving will ever be quite the same, so be sure to purchase enough for your project. When it's gone - it's gone! If I do not have a sufficient quantity left to fill your order I will contact you immediately. Remember that all computer monitors show colors a bit differently, plus my camera skills are not so great. If precise shade is important for your project please ask for a sample to be sent to you before ordering. Note: Shipments outside the US will likely incur higher shipping costs than are calculated on this site. Please contact me prior to purchase so I can determine pricing for you.
" 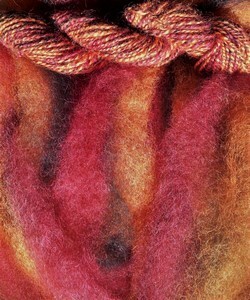 Recently I asked you about wet felting with cotswold, followed shortly by an order for two of your roving blends. (which delighted me upon their arrival. They are cloud soft!) 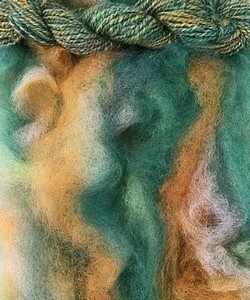 You expressed an interest in my view after I'd had a chance to try felting with it. The short version is that my view is much like yours. I am a beginning felter but have a little experience with both romney and merino, and now just one experience with your cotswold. It came out well in terms of structure, and beautiful in terms of your color blend. It's flat and uniform. It handled easily for me, similar to romney and easier than merino. I don't full as much as some other people so my piece is not as hard as it might be. However, it seems strong. It's not cushy but I can hardly keep my hands off it, and it's soft enough that I'm thinking of making a neck scarf. I like it well enough that today I plan to order a little more. Thank you for such a high quality product! " A very nice handling blend of the darkest wools from the flock. There are a very few silver fibers throughout but this is a nearly solid dark roving. Some luster but also some bounce. A pleasure to spin. 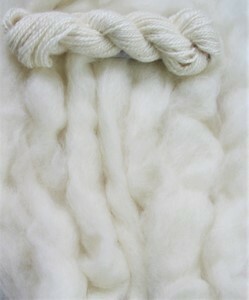 This milky white roving is pure Cotswold and made from some of our nicest fleeces with an eye toward hand spinning. High luster and a pleasant hand. Easy to spin and will create a versatile yarn - strong but not harsh. 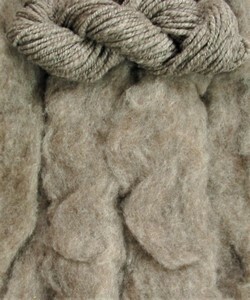 This medium gray roving is a mix of parts of many colored fleeces. Very slight brown overtones but mostly a pleasant gray. It does have some luster. Some lighter and darker gray areas of the roving will pop in a pleasant subtle way when spun and yields a very pleasant, squishy hand. A real pleasure to spin. Sky blue dye plus light and dark shades of gray wool equals a roving the exact color of your favorite pair of jeans. A beautiful blue with darker blue/gray overtones. It will work into a drape-y yarn just as comforting as those jeans, too. 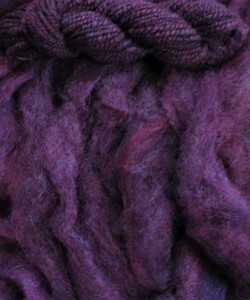 This blend is largely Cotswold and Border Leicester with some medium wool included. Smooth hand and some luster make for easy spinning and a nicely versatile yarn. 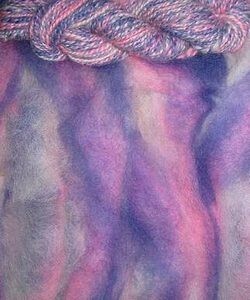 This deep purple is a blend of red and blue fibers and it gives a lovely depth of color with some subtle shading of 'more reddish' or 'more bluish' purple. The picture doesn't do it justice. In bright sun you can see a little luster but otherwise the yarn looks quite matte. Very pleasant squishy hand with nice springiness. 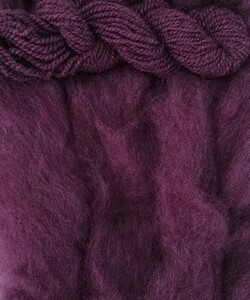 Gray Cotswold and Border Leicester fleeces dyed with shades of burgundy wine. A good dark purple with slight variation in shading due to the grays used. 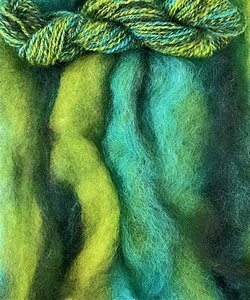 Silky hand and good luster make for easy spinning and a great yarn. 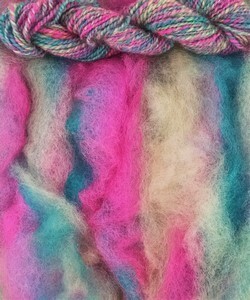 This roving spins into such a pretty yarn. The picture doesn't do it justice as I couldn't get it as white as it really is without washing out the blips of color. Bright white wool and sparkly firestar (not crazypants amounts, just enough to catch the light) and streaks of silk dyed in flower colors - yellow, orange, green, lavender - make a pretty yarn that makes me think of ladies in white dresses playing croquet on a lawn in front of a mansion. Yeah, I've read a romance novel or two in my day. Spins like a dream and the random colors of silk keep it interesting. Wow, this roving is a grove of maple trees in October! Bright yellow, cherry red and a double dose of dark gold pull this together into the perfect autumn colors. The dark gold keeps it all from getting out of control so you have bright fall colors but it's not garish. Silky hand and good luster make for easy spinning. I like the way this came out! Turquoise, acid green and black! Sounds about as compatible as oil and water but I think it works! Certainly different. I haven't used much black in colorways before but I appreciate the way it anchors the brighter colors and I already have some plans in my head. Pure Cotswold, so it spins very easily and has luster. What a delicious blend. Dusty cherry red with cinnamon and pale gold companion colors. This seriously looks like pie filling and baked pie crust. Drafts easily and has a good luster. 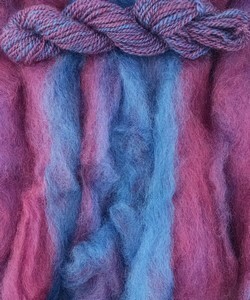 This tri-color roving is bright pink, pale blue and dark purple. I find some computer monitors show the dark color as navy blue but it is actually a dark purple. 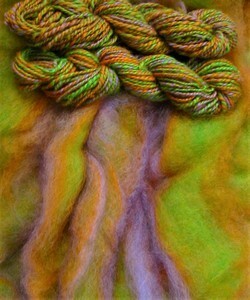 The three colors work well together but do stand out distinctly from each other in a spun yarn. Plying gives an especially nice marbled effect. There is luster because it's Cotswold and it spins like a dream! 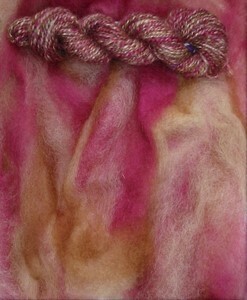 Muted red, salmon and charcoal blend together to make a roving and yarn that looks like smoldering embers in a campfire. Not bright colors, but very warm and darkish. 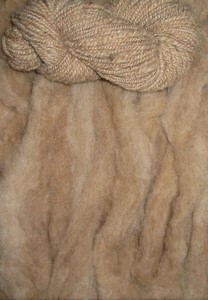 This roving is 100% Cotswold so it has good luster and spins sooo easily. You can spin the shades together for a more muted yarn or choose to separate the colors a bit so they pop more against each other. Either way, it's lovely. I love this mix. 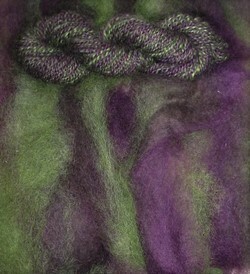 Moss green, deep purple and a streak of charcoal. The green is a little brighter than the picture shows. Good luster and a very pleasant hand. Would look nice made into anything! Only 1 lb and 8 oz. left. Lilac, orange and grass green. Wow! Those are party colors for sure! A nice balance of colors - all take their turn showing up and none are overwhelmed. Fun! Spins easily into a pretty, happy yarn. I thought I was getting all wild with orange and spruce and natural gray - turns out this roving is similar to Ferns and Moss but 'cooler' and softer. The colors make me think of working barefoot in the garden when the zucchini leaves are just starting to get dry and dusty. Pretty! And has a very pleasant hand too. Good morning! Looks like a sunny day. Pink, blue and yellow make for a cheery blend of colors. Nice luster and easy spinning. 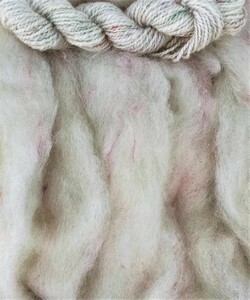 This group of fleeces was especially nice - good luster, soft and drape-y hand, and it nearly spins itself. There are actually three colors here - blue, red and purple - but the red and purple pretty much blended together. Still, the yarn is very pretty and could be used for just about anything/anyone.